Intradural herniation of disc fragments is an unusual manifestation of prolapsed intervertebral disc and results from perforation of posterior longitudinal ligament and dura mater. , Most of the reported cases have been at lumbar spine  and cervical site is rare. Most common clinical presenting features of intradural disc herniation (IDH) are Brown-Sequard syndrome and/or Horner's syndrome and the presence of these features should suggest the diagnostic possibility of IDH. We report a case of cervical IDH with cerebrospinal fluid (CSF) leak. A 45-year-old male presented with sudden onset weakness of right lower limb after heavy weight lifting in gymnasium. Neurological examination revealed decreased pinprick sensation below T3 dermatome on the left side and proprioceptive and vibratory sensations impairment and motor weakness in the right lower limb. Reflexes were brisk in right lower limb and right plantar response was extensor. Findings were suggestive of Brown-Sequard syndrome. 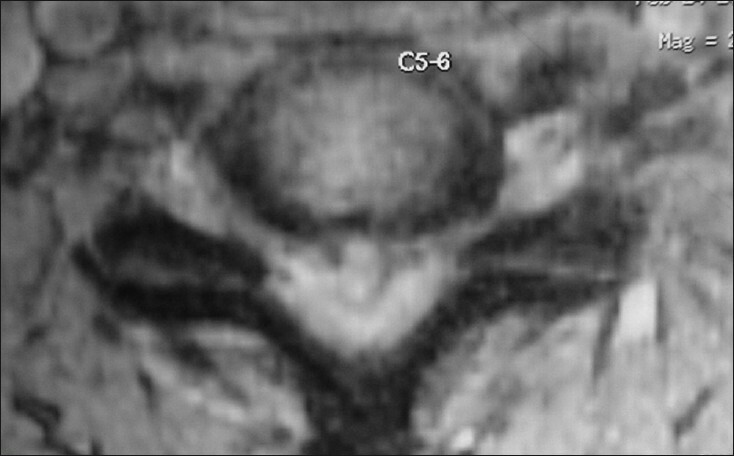 Magnetic resonance imaging scan of cervical spine revealed prolapsed C5/6 disc with widened subarachnoid space at that level raising the suspicion of intradural extension and cord compression [Figure 1] and [Figure 2]. The patient underwent removal of the disc with anterior cervical approach. The disc material was found herniating through the posterior longitudinal ligament and dura mater. The disc was removed gently. The spinal cord was visible through the defect. The defect was repaired with fat graft and fibrin glue. He did not undergo fusion or instrumentation. Postoperatively the patient had improvement in his weakness, but developed CSF leak from the wound on the third postoperative day. Multiple lumbar punctures (8 hourly) were done over 3 days and he was also started on intravenous antibiotics with which the leak resolved. Disc herniation in cervical spine most frequently occurs at C6/7 level followed by C5/6 level and the predilection for these sites is due to the force exerted at these levels as it acts as a fulcrum for the mobile head and spine. Disc herniation posteriorly is prevented by the posterior longitudinal ligament. IDH occurs when there is perforation of posterior longitudinal ligament and dura mater. Dandy suggested that acute pressure of the protruded extradural disc may erode and penetrate the anterior wall of the dura mater. This hypothesis was also supported by Lyons and Wise. IDH is more frequently reported at the sites where there is increased spinal movement. The prolapsed disc may result in chronic irritation and tear of dura mater secondary to vertebral movement. The common site of IDH is lumbar spine and rarely at cervical or thoracic spine. 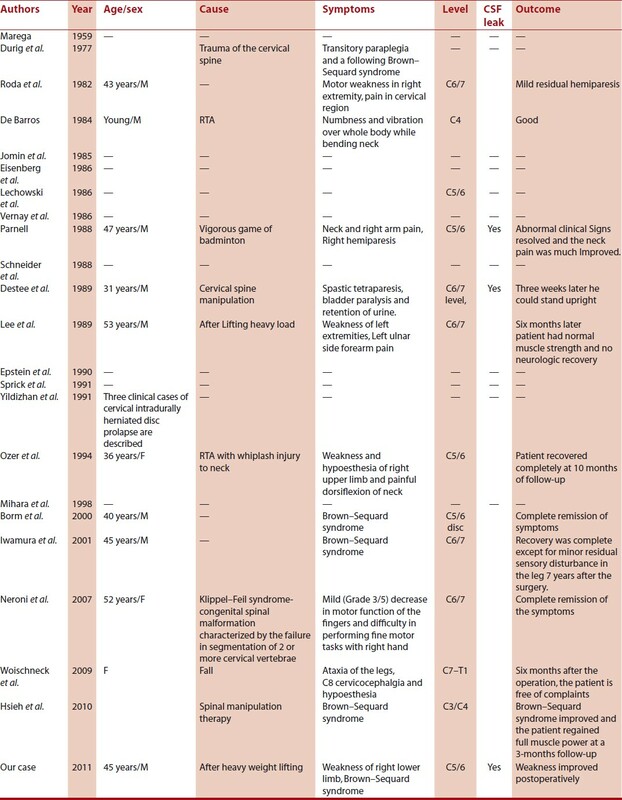 Over 100 cases of IDH have been reported,  however, only in 25 cases, including the present patient, the site of IDH is cervical spine ,,,,,,,,,,,,,,,,,,,,, [Table 1]. The common clinical presenting features of IDH are Brown-Sequard syndrome, ,,,,,,, transverse myelopathy, ,,,,,,, and rarely adiculopathy. The onset of symptoms is typically sudden, although there may be a period of local and radicular pain. Our patient presented with features of Brown-Sequard syndrome. Our patient underwent discectomy through anterior cervical approach and postoperatively had improvement in his symptoms but developed CSF leak from the operative wound on the third postoperative day. CSF leak following cervical discectomy is an uncommon complication. In our patient the preexisting dural defect has probably predisposed to the leak. Precaution against CSF leak is essential in these patients. The defect was covered at the time of surgery with fat graft and fibrin glue in our patient. In spite of this, the patient manifested with CSF leak. This was managed with prophylactic antibiotics and serial lumbar puncture and CSF drainage for 3 days. CSF leak resolved with this management. The management of this problem has not been discussed much in the literature. Suturing of the defect through anterior approach has been described. Prophylactic lumbar drainage should be considered in such cases for 3-5 days. This is essential to avoid the risk of meningitis secondary to the CSF leak. 1. Dandy WE. Serious complications of ruptured intervertebral discs. JAMA 1942;11:474-5. 2. Lyons AE, Wise BL. Subarachnoid rupture of intervertebral disc fragments. J Neurosurg 1961;18:242-4. 3. Smith RV. Intradural disc rupture. Report of two cases. J Neurosurg 1981;55:117-20. 4. Epstein NE, Syrquin MS, Epstein JA, Decker RE. Intradural disc herniations in cervical, thoracic, and lumbar spine: Report of three cases and review of the literature. J Spinal Disord 1990;3:396-403. 5. Parnell AP. Cervical intradural disc protrusion. J Neurol Neurosurg Psychiatry 1988;51:1007. 6. Koc RK, Akdemir H, Oktem IS, Menku A. Intradural lumbar disc herniation: Report of two cases. Neurosurg Rev 2001;24:44-7. 7. Görgülü A, Karaaslan T, Tural O. Intradural and intraradicular lumbar disc herniations: Case report and review of the literature. Norol Bil D 2004;21:4. 8. Borm W, Bohnstedt T. Intradural cervical disc herniation: Case report and review of the literature. J Neurosurg 2000;92:221-4. 9. Iwamura Y, Uematu H, Yamasita H. Intradural lumbar disc herniation: A case report. Seikei Geka 1991;42:1947-52. 10. Caetano de Barros A, Caetano de Barros M. Traumatic extradural and intradural herniation of a cervical disc treated surgically. Surg Neurol 1984;21:577-80. 11. Destee A, Lesoin F, DiPaola F, Warot P. Intradural herniated cervical disc associated with chiropractic manipulation. J Neurol Neurosurg Psychiatry 1989;59:1113. 12. Durig M, Zdrojewski B. Intradurale sequestration einer cervikalen diskoshernie: Ein kasuistischer beitrag. Arch Orthop Unfallchir 1977;87:151-7. 13. Eisenberg RA, Bremer AM, Northup HM. Intradural herniated cervical disc: A case report and review of the literature. AJNR Am J Neuroradiol 1986;7:492-4. 14. Iwamura Y, Onari K, Kondo S, Inasaka R, Horii H. Cervical intradural disc herniation. Spine (Phila Pa 1976) 2001;15:26:698-702. 15. Jomin M, Lesoin F, Wareille A, Destée A, Gozet G. Extra - and intradural cervical disk hernia. A case. Rev Rhum Mal Osteoartic 1985;52:593-4. 16. Lechowski S, Urbaniak J. Intradural herniation of the intervertebral disk of the cervical segment of the spine. Neurol Neurochir Pol 1986;20:589-91. 17. Lee ST, Cheng SY, Lui TN. Intradural rupture of cervical intervertebral disc. Spine (Phila Pa 1976) 1989;14:1412-24. 18. Marega T. Ernia del disco cervicale espulsa nel sacco durale. Arch Putti Chir Organi Mov 1959;12:425-30. 19. Mihara H, Ohnari K, Tanaka K. Intradural disc herniation in the cervical spine: A case report. Kanto Seikei Saigai Geka 1998;29:27-32. 20. Ozer AF, Ozek MM, Pamir MN, Zýrh TA, Erzen C. Intradural rupture of cervical vertebral disc. Spine (Phila Pa 1976) 1994;19:843-5. 21. Roda JM, Gonzalez C, Blazquez MG, Alvarez MP, Arguello C. Intradural herniated cervical disc: Case report. J Neurosurg 1982;57:278-80. 22. Schneider SJ, Grossman RG, Bryan RN. Magnetic resonance imaging of transdural herniation of a cervical disk. Surg Neurol 1988;30:216-9. 23. Sprick C, Fegers S. Intradural sequestration of cervical intervertebral disk displacement. Nervenarzt 1991;62:133-5. 24. Vernay D, Rampon S, Fraysse P, Cheminat JC, Irthum B, Clavelou P. Extra - and intradural cervical hernia. A new case. Rev Rhum Mal Osteoartic 1986;53:403. 25. Yildizhan A, Pasaoglu A, Okten T, Ekinci N, Aycan K, Aral O. Intradural disc herniations: Pathogenesis, clinical picture, diagnosis and treatment. Acta Neurochir (Wien) 1991;110:160-5. 26. Hsieh JH, Wu CT, Lee ST. Cervical intradural disc herniation after spinal manipulation therapy in a patient with ossification of posterior longitudinal ligament: A case report and review of the literature. Spine (Phila Pa 1976) 2010;35:E149-51. 27. Woischneck D, Schmitz B, Kapapa T. First description of an intradural disc herniation at the C7-T1 level. Z Orthop Unfall 2009;147:600-2. 28. 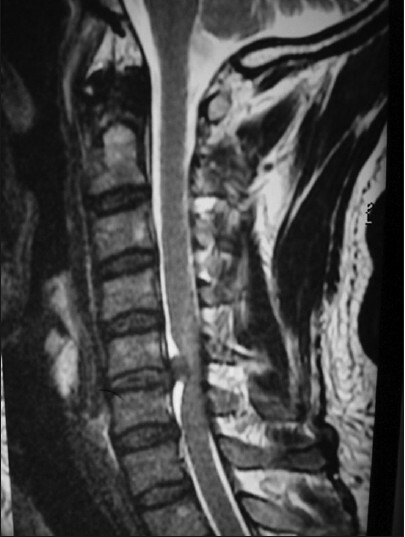 Neroni M, Gazzeri R, Galarza M, Alfieri A. Intradural cervical disc herniation in a Klippel-Feil patient. Spine (Phila Pa 1976) 2007;32:E608-10. 29. Iwamura Y, Onari K, Kondo S, Inasaka R, Horii H. Cervical intradural disc herniation. Spine (Phila Pa 1976) 2001;26:698-702.